OneLock uses advanced zero-knowledge encryption to secure your data. 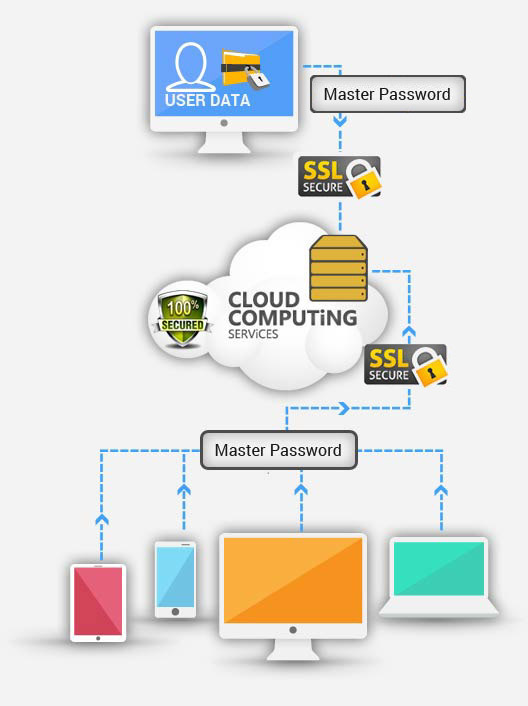 We use an AES 256 bit algorithm to encrypt your passwords and personal information locally on your device before it's securely transferred to our cloud server using SSL 2048 bit encryption. This means OneLock employees have no access to your data. We also use key stretching with PBKDF2 which adds extra security. To retrieve your data it's exactly the opposite. We send over your encrypted data from our cloud server to your local device and decrypt the data there with your master or pattern login. We use our proprietary processing engine to store and retrieve your encrypted data. While this process is quite complex the front end is greatly simplified for a pleasant user experience. We use an AES 256 bit algorithm to encrypt your messages and files locally on your device before it's securely transferred to our cloud server using SSL 2048 bit encryption. Again not even OneLock employees can read your messages or files. We also use key stretching using PBKDF2 that adds extra security. Further we use an RSA 2048-4096 bit key to encrypt the AES 256 symmetric key. The RSA private key is encrypted using your master or pattern password. OneLock uses AES-CTR with MAC or AES-GCM mode for encryption and authentication of the files.